Since 1994, Grindstone Graphics and Marketing Services, Inc. and trekwest.com have been providing a full range of marketing services to clients throughout Southern New Mexico. Laura in search of a story. Laura Doth brings a wealth of marketing experience to the Grindstone Graphics group. Growing up on a pistachio farm (Heart of the Desert Pistachios) in Alamogordo, New Mexico, she is intimately familiar with the concerns of small businesses as well as it's marketing needs. A graduate of Baylor University with a Bachelors of Business Administration degree in marketing management, Doth also holds a Masters of Science in Marketing from the University of Arizona. Her masters work includes a specialization in Race Track Management from the University of Arizona Race Track Industry Program. Laura Doth established Grindstone Graphics and Marketing Services, Inc. in July of 1994. As president, she provides a wide range of marketing services. She is the creative force in developing a variety of collateral materials including brochures, newsletters, flyers, rack cards, etc. She also places and creates advertising for newspaper, radio and television. A former Field Editor for Country Magazine, Doth is an accomplished free lance writer. She has written articles on resort areas of southern New Mexico. Its people and attractions have appeared in New Mexico Magazine, Endless Vacations Magazine, Gateway Magazine, the El Paso Times and the Lincoln County Relocation & Community Guide. Laura currently acts as President for the Ladies Auxiliary Guild which raises money for the Hubbard Museum of the American West and the Lincoln County Cowboy Symposium. In addition, she is the Vice President and a founding member of Special Events Resource Group (SERG) a 501c3 non-profit organization. SERG puts on two special events each year -- the All American Gun and Western Collectable Show and the Ruidoso Oktoberfest. Proceeds go to scholarships for Lincoln County youth for continuing education. On the set of "Into the West". A native of Wisconsin, Mark spent many years breaking and training race horses. After spending more on his horses then himself but still loving the sport he made a decision to move into the operation of racetracks. Attending the University of Arizona, he graduated with a degree in Business Administration with a specialization in Race Track Management. His last gig at a racetrack was at Ruidoso Downs as Director of Marketing. Mark administered annual budgets ranging up to $500,000 and oversaw a period of tremendous growth and success for the track. He left the track in 1994 to partner with his wife at Grindstone Graphics and become Vice President. Mark is the technical wizard behind many of the challenging creative concepts we implement. He attends industry conferences and seminars for continuing education insuring Grindstone Graphics remains on the forefront of technology. He is in charge of our photography and mechanicals department and acts as our web guru. An accomplished writer and free lance photographer, Mark’s work has appeared in New Mexico Magazine, Gateway Magazine, Personal Systems (an IBM corporate publication), and Life Magazine. 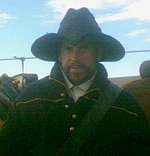 Frequently, Mark works as a location scout for the New Mexico Film Industry in Lincoln County and has been an extra in several films including the docudrama mini-series "Into the West". Mark coaches soccer and ski racing in his free time. He also serves as President and is a co-founder of SERG.